Use this cove cutting table generator to generate pre-calculated cove cutting angles for cutting coves on you table saw. Use the fields to customise the table to your table saw dimensions. 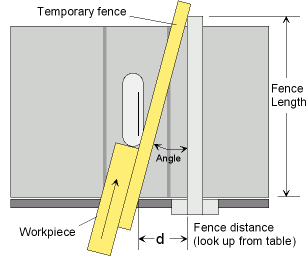 For a given cove width and depth, use this table to look up the fence distance 'd' or fence angle. For angles larger than 30°, the angle is in degrees, followed by a '°' is shown instead of the fence distance. All dimensions are in millimeters.